AntikBar will be participating in two fantastic London events this Autumn: the annual LAPADA Fair in Berkeley Square, 23/24-28 September, and the next Decorative Fair in Battersea Park, 30 September-5 October. We will post updates on our News & Events page and on our social media pages nearer the time and during the events. We look forward to seeing you! AntikBar will be exhibiting at Stand C31 at the 6th Annual LAPADA Art & Antiques Fair in Berkeley Square, London, from Wednesday 24th to Sunday 28th September (see below for opening hours and tickets, including the Collectors’ Preview opening day on Tuesday 23rd). Please let us know if you would like a complimentary e-invitation to this event. If you would like to receive an invitation to the Collectors’ Preview (limited availability) and would like to join our emailing list, please contact us. We look forward to seeing you at the Fair. For more information on this event and to purchase tickets in advance, please visit the LAPADA Fair website at www.lapadalondon.com. …We look forward to seeing you! NOTE: Visit our Facebook page at www.facebook.com/antikbar.co.uk for our photo slideshow from the Fair, which will be updated during the Fair week. London’s most popular decorative event held three times a year (Winter, Spring and Autumn) at The Evolution Marquee in leafy Battersea Park, London SW11 4NJ. AntikBar will be participating again by the hall entrance at Stand 141 and we look forward to seeing you. “The Fair is fun, fashionable and its worldwide reputation, established over 25 years, entices international trade and retail buyers, interior designers and private customers seeking unique and unusual furnishings and quirky accessories for decorating schemes.” A free shuttle bus will run between Sloane Square and Battersea Park. Please contact us to join our e-newsletter mailing list and to request a complimentary ticket to visit us at the Fair. An invitation is also available by clicking here. Visit our News & Events page for articles and reviews on previous Decorative Fairs. Full information is given on the Fair website at: www.decorativefair.com. All the fun of the fair – “Our Autumn Fair, which opens Tuesday 30 September to Sunday 5 October will feature a type of folk art as our special foyer display – fairground and circus art and artefacts. We’ll have posters, paintings and prints, objects such as carousel horses and figures, decorative panels from fairground rides and stalls. 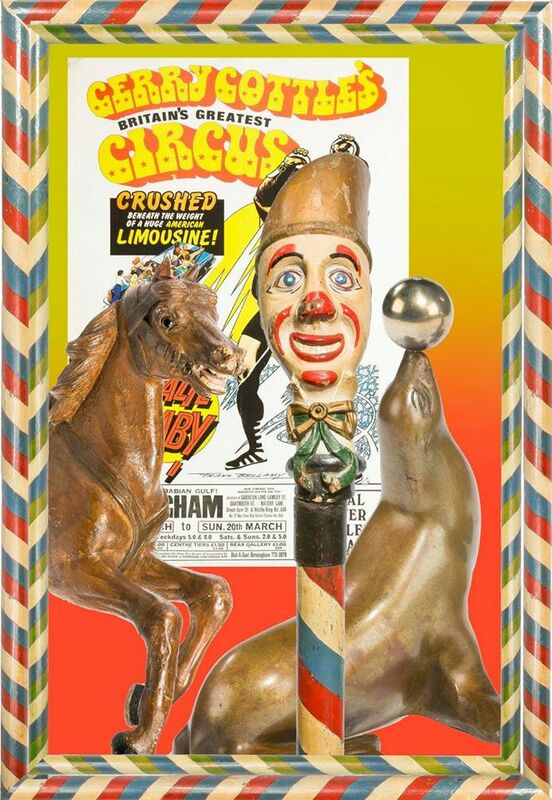 It’ll be great fun!“ – Foyer display update via The Decorative Fair, featuring AntikBar‘s original vintage 1976 advertising poster for Gerry Cottle’s circus (“Khalil Oghaby mighty strongman from Persia! First time here! Crushed beneath the weight of a huge American limousine!”) by renowned British comic artist, Frank Bellamy, along with some other fantastic circus and fairground items! Press Release “New dealers to show at The LAPADA Art & Antiques Fair 2014” (featuring one of our original vintage posters): “The LAPADA Art & Antiques Fair, Berkeley Square, brings together the very best in art and antiques this September, with over a hundred dealers and experts in their fields participating, representing a wide variety of disciplines. Now in its sixth year, this highly anticipated annual event in the art and antiques calendar welcomes a host of new dealers with exciting and original items to tempt buyers… Antikbar, the online poster gallery, will offer original vintage posters from around the world. Subject matters include travel, advertising, sport, cinema, war and propaganda, dating mainly from the late 1800s to the 1970s. It will also bring its sought-after selection of Soviet-era posters from the 1920s and 1930s in bold and bright colours that leave a lasting impression…“ Read the full article at http://artdaily.com/. “Telegraph Luxury selects stand out pieces from this year’s LAPADA Art & Antiques Fair” – the Telegraph’s selection includes one of our original vintage posters for St Moritz (featured image). View their full selection at www.telegraph.co.uk/luxury/pictures/.